Bring a little sunshine into your life with our new and delicious California Chicken Tendercrisp. Stacked with succulent crispy chicken, fresh lettuce, onions, juicy tomatoes and oozing cheese. Topped off with an all-American white cheddar and chipotle ranch sauce that’s creamy, tangy, a little spicy, and totally, totally, awesome. 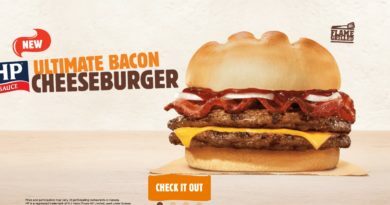 So, the third of BK’s current Route 66 promotion, which has been going rather well. Like the Chicago Steakhouse before it, I have no idea what makes this one Californian. The naming process on these promotional items is bonkers most of the time (reaching a particular low point with last year’s Fantastic Supreme or whatever it was called). 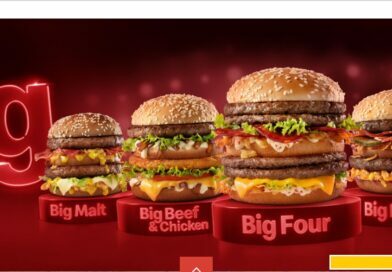 Burger King’s promotions quite often seem to take the form of two beef and one chicken item, released at the same time, and remaining for the duration of the offer. It’s the same here. 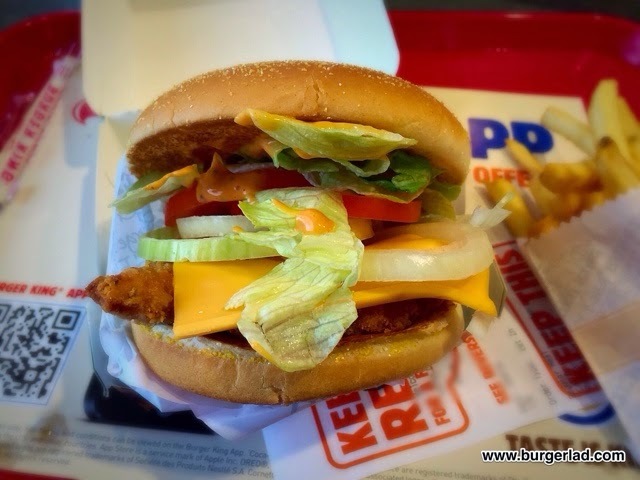 The chicken on is a supposedly Californian version of the Tendercrisp, where along with lettuce, onions and tomatoes, there’s cheese and a chipotle ranch sauce. The latter is certainly the defining feature of this burger and if they get it right, has the propensity to round off the promotion with another fine burger. Three times in a row I’ve been at the same branch of Burger King with my notepad. They are going to start thinking I’m reviewing burgers or something! 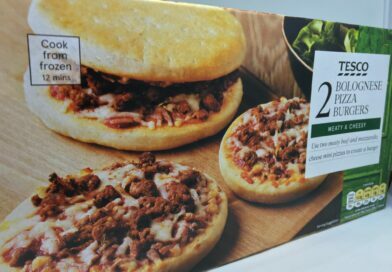 Anyway, order in, I waited a short while for the burger, involuntarily eavesdropping on a staff meeting that was taking up about a third of the floor space. 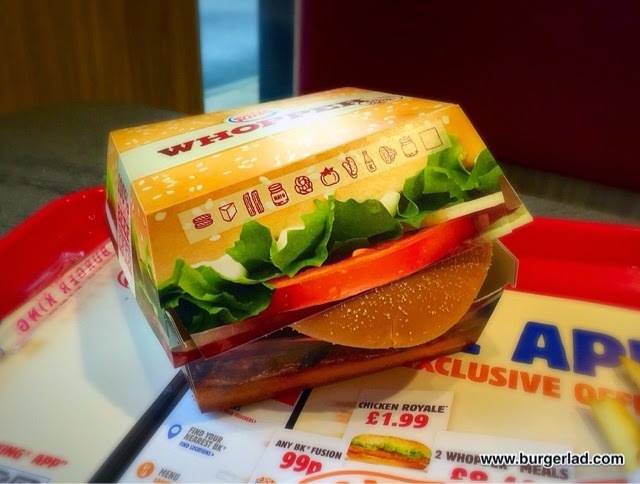 When my order arrived, the polite young lady apologised for the normal Whopper box. Apparently they had run out of the promo Route 66 boxes – possibly a good sign for sales of the limited editions. I tucked into the fries first. BK fries are OK at best, but on this occasion they were stone cold. Taking them back would have let my burger go cold too, so I just left them. The burger looked alright. It had been put together roughly similar to the marketing pictures but was a little lopsided. I removed the tomatoes as I had a nosey under the lid. A lot of ingredients in fairly substantial quantities. A good spread of lettuce and onions. Even the tomatoes, for those of you who like them, were substantial and fresh. The cheese is described in the blurb as “oozing” and it simply wasn’t. It was the standard square slice of cheese that was still solid. Straight from fridge to bun without being heated it seems. 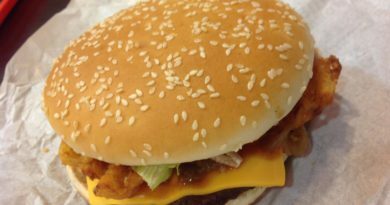 Lack of melted cheese is another of my fast food bugbears. But that aside, as I was tucking in, I found myself really enjoying it. With fast food, my enjoyment is directly linked to my speed of consumption, and I found myself wolfing this down. It was good for two main reasons. 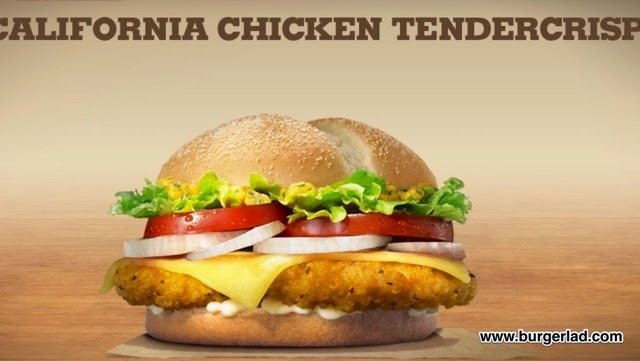 Firstly, BK’s Chicken Tendercrisp is well named. The meat is tender and the coating is crispy. It’s very tasty, entirely fit for purpose and (I can’t resist using that tired old term that always refers to chicken) succulent. Although neither melted nor oozing, the cheese on here worked well to soften the flavours and give a large amount of comfort and warmth. Secondly the ranch sauce – OK, not as gobsmackingly amazing as the blurb might lead you to believe, but still very good. 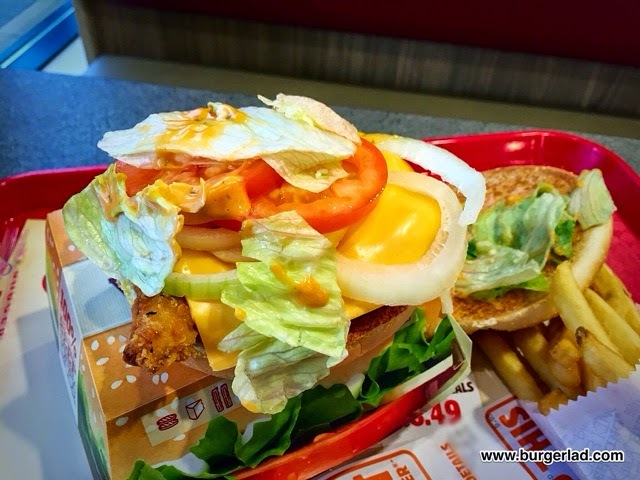 Slightly spicy and settles in well with the cheese and juicy chicken, it is noticeable but not overpowering. Again, no idea why it’s “Californian” specifically, but it is good. The bun crumbled a bit towards the end. It seems common at BK and if anything I would suggest they have a look at changing the type of bun used. But frankly, I’m used to that now, and this burger was too enjoyable to care much about little gripes like that. At almost 800 calories, it’s substantial (although actually the smallest of the three offerings in calorie terms) but taste and my hunger levels dictated that I came within a whisker of ordering a second one. 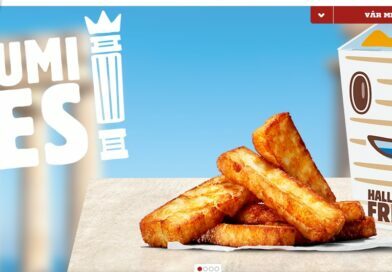 Rounding up, it’s my humble opinion that BK has rolled out a good solid promotion this time. 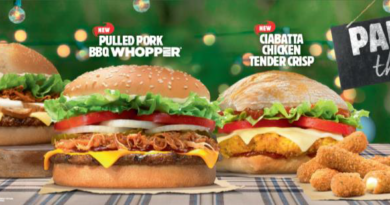 No lifetime classics perhaps, but a trio of good burgers and a great start to the year from Burger King. Must admit this burger went down quickly and l did find it as delicious as the £3.89 Chicken & Cheddar Classic from McDonalds that is sadly no longer available. 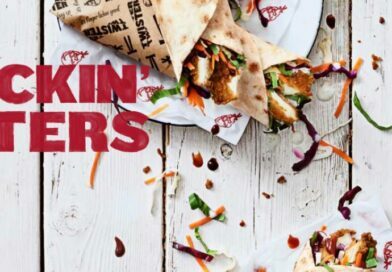 In my view this is not worth £1 more (BK are starting to approach Gourmet prices if they are not careful) and it is £3 more than the Chicken Royal (if you use the iPhone app voucher). 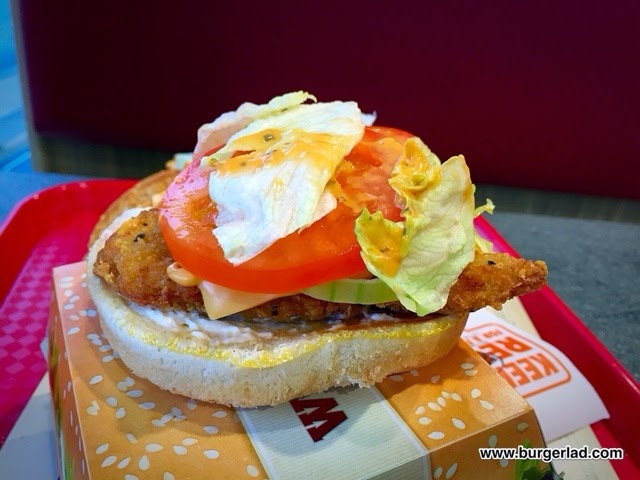 Regardless it is IMHO the best prepared chicken burger from BK and worth a try.